6 Principles of the Science of Persuasion to Get more Customers! Use these 6 principles behind the Science of Persuasion (or Science of Influence) and start getting more customers before your competition does, or you may lose your business! Surely you’ve asked yourself more than once, what makes one person more successful than another? Or a certain business more lucrative than their competition? Maybe you’ve been trying hundreds of different techniques to imitate them and increase your sales, but not be able to obtain the same results? It’s common to attribute their success to luck, position, charisma, or economic power. But this is definitely not the whole picture. Although these factors are important, Psychology also plays a significant role in a successful reality. If you think that success is only based on luck, you’re going to change your mind as soon as you read about some of the most powerful tools for getting clients: The Science of Persuasion or Science of Influence. The Science of Persuasion: What is it? We have the power to capture the public, influence the undecided, and motivate purchases. There’s no magic involved, but actually scientific knowledge. The science of persuasion or Science of Influence comes from social psychology. Books and Influence: Influence: The Psychology of Persuasion by Robert Cialdini shows us how we can develop our communication skills in order to influence the decisions of individuals. 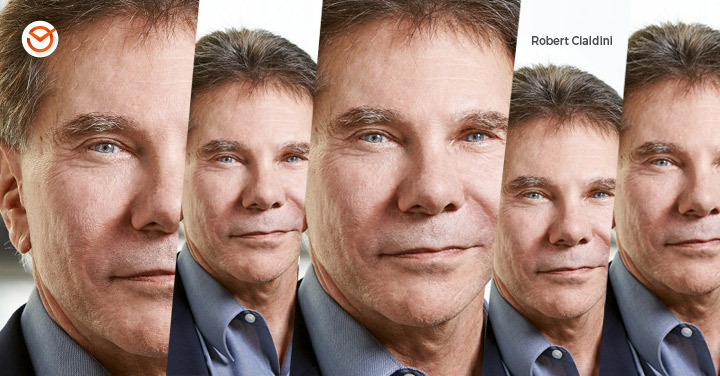 Robert Cialdini is a professor of social psychology at Arizona State University and has conducted a series of investigations on the operation of persuasion in real life. Based on his research, the theory of persuasive communication has been developed. It’s based on taking advantage of certain behavioral patterns collectively internalized in the human psyche, in order to influence behavior. It’s about understanding how we can develop our communication skills in order to influence the decisions of individuals. The main objective when implementing these principles is to get more sales, more subscriptions, more visits to your website, and more downloads. This means you’ll be able to capture your website’s users and transform them into customers! Let’s take a look at how we can apply some of these techniques in order to obtain benefits (conversions, clicks, shares, sales, emails, subscribers and more!). If a request is preceded by an unexpected gift, it has greater potential to convince potential customers. The gift will make them feel the importance of returning the favor, or to reciprocate. Social norms compel us to respond to a favor with another favor, in order to not be considered ungrateful. Think about your daily life … Isn’t easier to get a person to do you a favor after you’ve given them a gift or done something for them? That feeling of obligation makes them more inclined to agree to your request. An initial favor will be reciprocated many times over in the future. The most common example of applying this principle in marketing are “free samples”. But be careful! To use the principle of reciprocity to influence others, we must first be clear about who our target audience, know why we want to influence them, and what exactly those people want. Once you’ve got all this, you can identify what would be appealing to them to receive for free, that way you can implement the principle of reciprocity successfully. Another example of applying this principle to Social Media Marketing is in content. Provide your readers with information and free training with highly practical content that will better their lives. 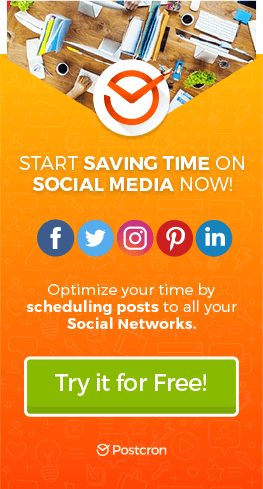 This will make them visit your site and share your content across different social networks. And… based on the law of reciprocity it’s more likely that your readers will feel compelled to buy on your site or to recommend it to their friends as a way to repay you for how you’ve helped them. 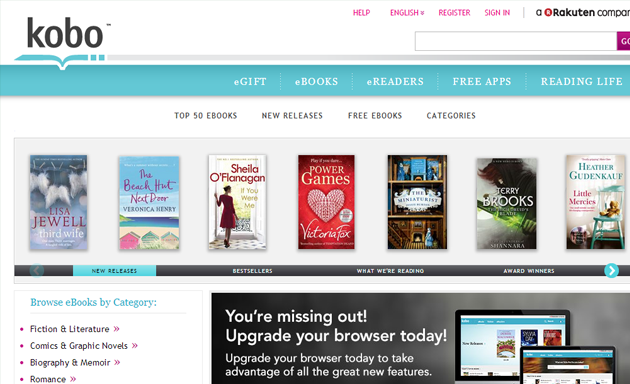 Kobo is a page dedicated to digital reading, providing users with hundreds of e-books to purchase and download. Kobo has quickly become a global leader in digital reading, offering a world-class platform for readers. Continuing with our concept, the site offers free apps for its users so they can access their e-books from almost any device (whether they operate with Apple, BlackBerry, Android, or Windows). In this example of conversion optimization, we can see the reciprocity present when Kobo gives the visitor a free application which provides them with practical benefits for consuming their product. • Offer an e-book with relevant information (that’s amazing, inspiring, or super interesting!) to download for FREE. • Allow users to download or use your applications or programs for free for a period of time. • Give your potential customer an item that he/she considers valuable. Remember the movie “Pay It Forward”? It’s a great example of the principle of reciprocity put into action. Human beings have a tendency to want to appear consistent in front of other people. We have a need to be consistent with what we’ve done, what we said, and what we’ve bought. When making any decision, we feel the “pressure” to behave in accordance with our prior commitments. For example, this principle can explain why it’s easier to keep a customer than attract a new one. The influence of the principle of commitment is based on the desire to look and appear like a person with consistent attitudes and behavior over time. Once we’ve publicly committed to something or someone, then we’re much more likely to go through with the plan… hence consistency. I’ll give you a practical example: Suppose you have 5 different phone numbers for pizza deliveries places that you like. The first week you call 3 of them and make your order, but only 2 of them deliver your pizza in a timely manner and in a good state. The next week you only have enough minutes to make one more call, which of the 5 deliveries would you call? Probably one of the two who did a good job the first week, since they’ve already fulfilled their job for you once and because the principle of coherence tells us that they’re likely to do it again. Marketers have figured out how to use Cialdini’s second principle in their efforts to get higher conversion rates. They can make site visitors commit to something relatively small and usually free of charge, like a technical document, filling out a form, or creating an account. This increases the likelihood that site visitors see themselves as loyal customers over time, and allows for easy access to the purchasing products or joining certain services. For example, Spotify, when optimizing conversions, uses the principle of commitment to guide the visitor to a particular course of action, which will at some point result in a sale. 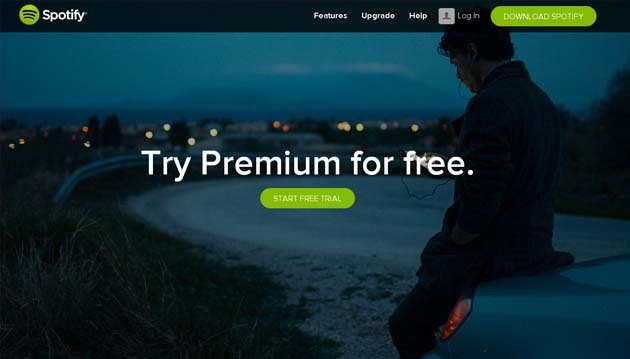 For example, getting a visitor to adquire the premium option with a free trial, means that it’s more likely that they’ll actually buy that option in the future. The resource of creating a user account within the site also serves this purpose. Another resource used by digital marketers to increase conversions, even though it’s a bit more advanced, is re-targeting. It’s also based on the principle of consistency: If you had $100 and you had to choose someone to spend it on, would you choose someone who’s already shown interest in you, or a complete stranger? By the principle of consistency, we would spend it on the person who has paid the most attention to us! Offer free trials for your product for limited time. If you’re selling a high priced product, first try to obtain a YES in smaller items. For example: try to get your potential customer to subscribe to your mailing list, to read one of your articles, or to watch one of your webinars. Then, the customer will feel much more “committed” to buying from you because of the the principle of consistency. 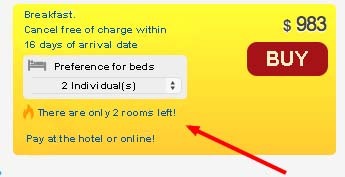 Try to get the user to click on something on your site, then on another, and then on another. Each click is a tiny commitment and by principle of consistency, the visitor who clicks more, is more likely to buy. You arrive to a new city that you’re not familiar with and you go out looking for a restaurant. You get downtown and there are two very similar restaurants. However, there’s one fundamental difference: one is almost full and the other is completely empty. Which one would you choose? When we feel uncertain about making a decision, we observe what others are doing to get “evidence” or social “proof” to see if something is OK or not. We tend to follow trends. And you can harness the power of social proof to dramatically increase conversion rates of your website. Messages like: “9 out of 10 people recommend ….” are good examples of the principle of social proof beeing applied to marketing. In this example, the sales pitch is based on the rate of collective approval. Amazon.com is a company known worldwide for selling goods over the Internet. We can see how they put social proof to use by considering the way they expose buyers and sellers to ratings that others have made about their products. This helps facilitate decision-making, because the decision is backed by other’s experiences. It’s characterized by the star rating (1 to 5), including the number of reviews received. You can also find comments from other users. Here at Postcron, we also use Social Proof to increase conversions on our landing page. 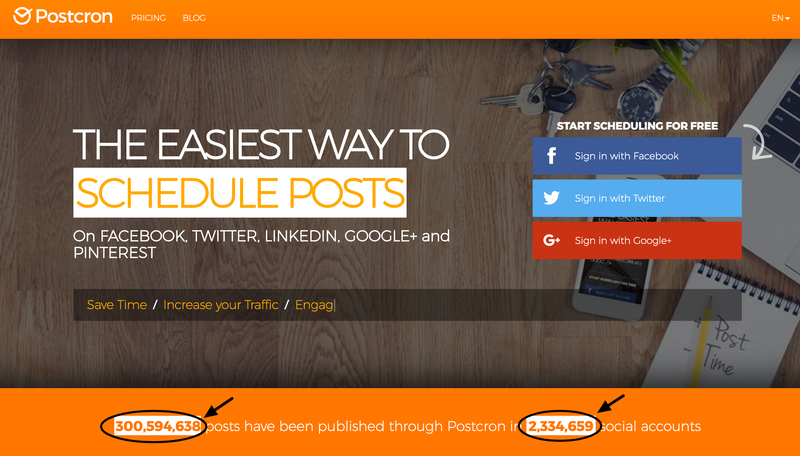 To do this, we show that more than 300.000.000 posts have been published through Postcron in more than 2.300.000 social accounts. Once again, the principle of Social Proof in action! We’re more likely to be influenced by the people who we like. If you like someone your more likely to do something they want or ask. This principle is also based on something as superficial as the physical appearance of a person. Companies that use sales agents within their community use this principle with great success. People are more likely to buy from people like themselves, friends, and people they know and respect. That’s why it’s so important to study your potential customers. I recommend that you read this article on how to execute a study of the “Buyer Persona”. Sympathy is key to selling. Rarely someone will buy something from someone they don’t like. 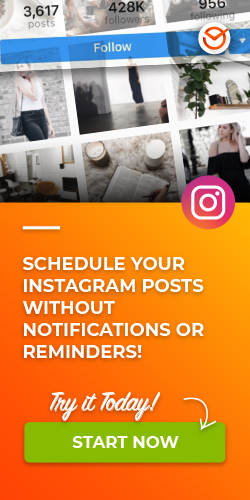 This principle can be applied to Social Media Marketing as follows: A company that wants to increase their conversion rates, should simply focus on creating a beautifully executed page with elements that make the visitor feel represented by images, colors, words, and the people shown in it. The “About Us” part on a landing page is an excellent opportunity to tell and show potential buyers all the similarities between them and us. This easily makes customers feel a connection with someone or something they like and that represents them. You can actually experience a clear example of this principle by going to any Apple Store. As you enter, you’ll notice that the salesmen are dressed in jeans and blue shirts (and not in a suit and tie!). They are dressed informally because they represent the typical Apple buyer (relaxed, intelligent, and creative!). Speak the same language as your customers so they’ll feel represented by you. Dress in a way that’s aligned with your customers. People in general have a tendency to obey authority figures, even if those authority figures are questionable. When customers feel unsure about a purchase, they usually look for a testimony from a “person with authority on the subject” to serve as a guide. That’s why the opinion of professionals or experts is already a classic in the world of advertising. Adidas uses Lionel Messi as an indisputable authority figure in the world of sports, more specifically soccer. There’s no doubt about it. His influence and popularity lead him to be the visible face of countless advertising campaigns, whether sport-related or not. The use of sports figures has been a classic resource of Adidas over the years. On their website we can also see the important aesthetic display of their various campaigns. Some books for sale on Amazon.com have descriptions where we can see the testimonies of famous people on the subject. For example, if we want to buy the book “The Fortune Cookie Principle”, we can see a comment by Seth Godin, worldwide authority on marketing. If Seth Godin says I’ve got to read a book … then I’m gonna buy it! If an authority figure or a leader in your industry has made a positive comment about your product or service, make it known by showing it on your landing page or your pricing page. It’ll help increase your sales! things are more attractive when their availability is limited, or when we risk losing the opportunity to acquire them. The law of supply and demand plays a big role in the principle of scarcity. If the customer perceives a low supply or high demand for a good, they’ll show that they’re immediately interested and even willing to pay a higher price. Opportunities seem more valuable when we find it harder to get them. Ticketmaster uses the scarcity principle as one of their main resources. Their website is full of deals offered for only a limited time and packs of exclusive tickets. They’re one of the leading companies for buying tickets to musical, film, or sporting events. If you sell a product and there are only a few items left, make it known! People will want to buy the product even more. Cialdini’s 6 principles of persuasion are rarely used independently, but rather combined with others as part of one comprehensive marketing strategy. While I was investigating the Quick Sprout site (for an example of reciprocity) a series of limited offers popped up (e.g., scarcity). The principles can be applied at different times, to different publics or products, and also be used simultaneously. Don’t limit yourself to just one. However, eventhough these are very useful tools for designing marketing strategies, you should not abuse them, because if they become too obvious, they can actually affect the brand in a negative way. These 6 principles of persuasion and influence have been used for decades by companies, salesmen, and unconsciously by each one of us in our daily lives. Ever since the explosion of e-commerce over the Internet, Cialdini’s six principles have naturally adapted to this new scheme. Persuasion is the name of the game in the world of business. Perhaps you weren’t aware of this before. But now you know that if you apply them correctly, you’ll be able to generate an unmistakable boost in your conversion rates over time. Don’t be afraid to give your potential customers a free sample or two, and definitely tell them how your product won’t be available for much longer at certain prices. It’s the customer’s decision that moves the entire marketing process, so that’s where we need to be influential. There may be thousands of tips for gaining customers, but the principles of persuasion guarantee that you’ll influence them and lead to an increase in conversion rates (users to customers).